Heritage Pork Spare Ribs for sale. Buy online at Zingerman's Mail Order. Gourmet Gifts. Food Gifts. When we talk about pork ribs, often we’re thinking of baby back ribs. They’re next to the pork loin, and they’re correspondingly tender and mild in flavor. 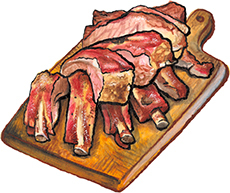 Spare ribs, on the other hand, are closer to the sternum, right next to the bacon (though they don't come with any bacon). The meat has deep flavor and an awesome layer of luscious fat. These spare ribs come from heritage-breed pigs that spend their whole lives out on pasture in upstate New York. Great on the grill or roasted in the oven.